DOW recovery during day shows it just can't drop much! Don't worry about STI or KLCI! It is important that a trader develops a feel of the market. We need to sense how the market is. Today the performance of DOW Jones just shows me something. The market is still bullish, and can't drop much. Not Even after a 399 points drop at the opening 2 hours. One way of sensing the sentiment of the market is to take note of what happen during the day when there is a big fall or what happen the next few days after a big day tumble. 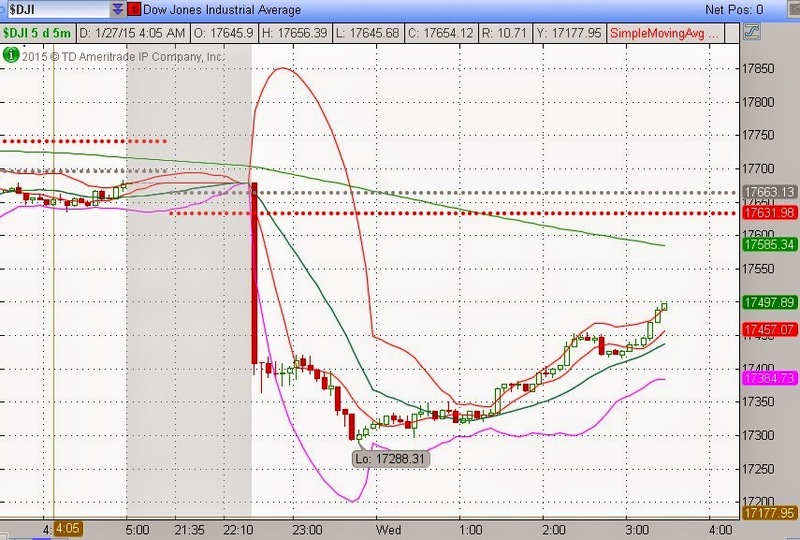 Looking at the intraday chart, we can see that the DOW recovers half the points during the session. It is still 2 hours to the closing (3.15am local time now), but looking at this recovery, I have confidence that the bullish momentum is still alive. Again I would like to emphasize that DOW has a major support at 17000! Do not be worried about STI or KLCI now. The bullish momentum is still strong! STI is now above 3400 and KLCI has zoomed past 1800! I believe they still have legs to run! Today opening may see weaker price, but it won't be for long! Time to focus a bit on local stocks! There are so many stocks that shows big players are now coming in to scoop up the stocks. Do not waste this opportunity to accumulate them! In my blog, www.danielloh.com , I did touch on some of the Singapore and Malaysia momentum stocks to watch out for! Take a look. Malaysia stock market is going crazy after the recent sharp drop. Take note of some malaysian stocks. Ecowld (8206) is one of them. This is one stock that I like fundamentally. Recently we spotted players are accumulating this stock. Join the seminar to find out! 2) How do you know stocks has a good earnings? 3) Will STI continue its forward surge? What is the matter with DOW?! Where is the support? Today the market looks bad. A 300 points drop during mid day in the DOW Jones. Today's drop, I would say, is due to 2 factors. 1) The bad retail sales report that was released today. The actual result of -0.9% is too surprising compared to the expected 0.2%. This result is horrendous considering it is the worst retail sales report since mid 2010. And this result comes on the heels of a supposedly "good" december holiday period seems all the more surprising! And that explains the big drop today. This drop is a follow through of the poor ISM manufacturing report that came out on 2nd Jan. In Jan, DOW has already dropped around 700 points. 2) The second reason DOW has dropped is because of the poor results recently issued by one of the well known financial bank JP Morgan. Bad earnings miss: $1.19 actual EPS vs $1.30 estimates. Wallstreet are taking the opportunity to sell as they expects the same results from other financial banks that will issue earnings in the next few days. Today JP Morgan dropped 4%! However I would suggest let us wait for the other banks results first. It might not be that bad. The reason why JP Morgan results is poor because they report a $990 million in legal expenses, or $1.1 billion on a pretax basis, which was higher than many analysts had forecast. J.P. Morgan is being investigated by the Justice Department over alleged foreign-exchange rigging and is expected to strike a deal on the matter. However I would suggest the other banks might not be having such a poor results as they dont have legal issues. I remembered that last year Bank of America also faced a similar situation when they lost quite a lot in legal fees. Their share price also tanked. But in the end it came back. To summarise, I would say don't worry too much yet until we see more data on the earnings season. One JP Morgan does not meant anything. Furthermore, I think DOW still has a strong support at 17000! 300 points away from now! Don't fret just yet! It is a chance to buy stocks cheap, not sell! Daniel Loh has correctly predicted the revival of China Shanghai composite when it broke 2500 on TV and radio last year!!! Learn what index Daniel Loh is looking at next that might revive exactly just like Shanghai Composite. Join the seminar to find out how he does it! 1) How do you use 2 steps to find the bottom of an index or stock? 2) Market Outlook for 2015? 3) Prediction of Crude Oil? Will we have good employment figures to stop the DOW drop? DOW these few days hasn't been good. It drop from 18103 to 17371 in just 6 trading days, a drop of around 600 points. 600 points doesn't seem much, does it? This drop is contributed by 2 factors. 1) Crude oil continues to go lower and lower and this has affected the DOW. Speculators continue to push the price of crude down. Asian, European and American futures traders take their turns to push down the price one after the other. The fall of crude now has nothing got to do with demand and supply. It has nothing got to do with OPEC decision. Neither has it got to do with the cost price of oil. It has got to do with the abundance of money in the market. With different countries printing money, this easy money has trickled down into the hands of big speculators and institutions who don't really care about the economy. One word - GREED! Having said that, I do think that DOW will slowly detached itself from the influence of crude price as we grow accustomed to the fall of crude. 2) The second factor that affected the drop is the economical report that came out last friday. ISM, institute for supply management has a figure that is below the forecast. Its actual figure is 55.5 versus 57.6 forecast figure. It is a total surprise considering that last month we are still in the midst of the holiday season. With another important jobs reports that is going to come out this friday, the non-farm payroll report, traders take the chance to profit take. And I think this uncertainty about friday figures pushes the DOW down. However having said that, our research shows that this jobs report figure on friday may have a good chance of beating the forecast. And there may be a rebound should it beat. In fact today we should already get a glimpse of how the jobs are. There will be a ADP employment report that is a precursor to friday non farm report. I wont be surprise that there may be a rebound if the figures are good! a) Report is above expectations: May consider buying some oversold and good stocks. b) Report is below expectations: DOW may still drop, my opinion is wait for DOW to touch 17000 and below before accumulating the stocks. Below 17000 is what we consider as cheap.